Ookla®, the global leader in broadband testing, network diagnostic applications and data has awarded Ucom with “The Fastest Mobile Network in Armenia 2017” award. 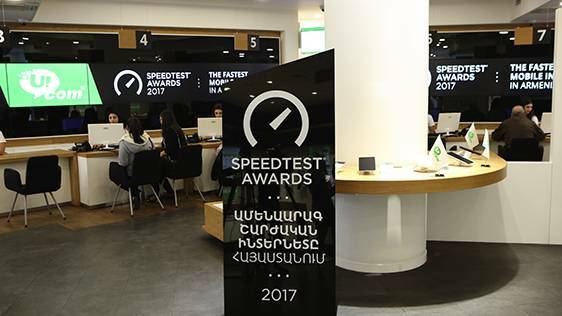 Ookla has collected and analyzed the results of speed measurements by mobile internet users of its Speedtest® application in Armenia during several quarters of 2017. "We are pleased to award Ucom with the award for Fastest Mobile Network in Armenia. This recognition is testament to their exceptional performance in Q2–Q3 2017 based on Ookla's rigorous analysis of consumer-initiated tests taken with Speedtest. ", - said Jamie Steven, EVP at Ookla. “It is known that Ucom’s fixed network continuously maintains the leading position, thus making the fastest fixed internet services available for our customers. And as a result of Ucom’s 4G+/ LTE Advanced mobile network deployment, it is now more valuable that we are justly qualified by an international independent company as the fastest operator in Armenia”, - noted Hayk Yesayan, Director General at Ucom. It is noteworthy that according to the official data Ucom’s mobile internet speed result for 2017 is twice higher than that of the competitors’ (http://www.speedtest.net/awards/am/carrier/2017 ). Ookla’s methodology ensures accuracy of the data and reduces bias from things like repeated testing or those attempting to skew the results. They also use a variety of other methods to prevent fraudulent or inaccurate results. For a given location, the company aims to include only mobile networks that provide service for a significant number of customers in a specific geographic area. So, while one provider might be fastest in a particular city or region, they may not be suitable to be included in the fastest provider nationwide because they only serve a very small portion of that country. To be included in a given geographic area, a mobile network must meet a minimum threshold based on the number of unique devices testing each day over a six month period.